The accomplishments of the segregated Japanese American 100th/442nd Regimental Combat Team in Europe, one of the most decorated units in U.S. Army history, has been widely recognized as one of the ironies of the World War II experience given the wartime incarceration of over 110,000 West Coast persons of Japanese ancestry. Less well known were roughly 6,000 Japanese Americans who served in the Pacific theater as part of the Military Intelligence Service. 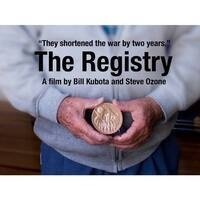 The story of the MIS, whose service is said to have shortened the Pacific War by two years, is told in the documentary film The Registry, which is accompanied by a post-screening discussion with the film’s director/producers Bill Kubota and Steve Ozone. Bill Kubota, Director/Director of Photography is a partner of KDN Films and Senior Producer at Detroit Public Television, directing local and national projects including The Ethanol Effect, which premiered on PBS in 2016. In 2007, he directed the national primetime documentary for PBS titled Most Honorable Son about a Japanese American who served in the U.S. Army Air Corps in World War II. He co-produced and served as director of photography of the DuPont-Columbia award winning documentary series Beyond the Light Switchin 2011 airing on PBS stations nationwide. Bill is currently working on short films looking at issues concerning housing, immigration and mass incarceration in the city of Detroit. Steve Ozone, Director/Producer, Steve Ozone is an award-winning photographer, based in Minneapolis, Minnesota, the location of one of the sites of the U.S. Army's Military Intelligence Service Language School featured in The Registry. His work examines immigration and “the other”. A commercial photographer for over twenty years, his work has been shown locally and nationally and is held in private collections.